With one of the highest urbanization rates in the world Chile is facing urgent challenges to develop infrastructure, water management etc. Join this business delegation to meet decision-makers in both the public and private city development in Santiago de Chile 20 - 22 March, 2019. 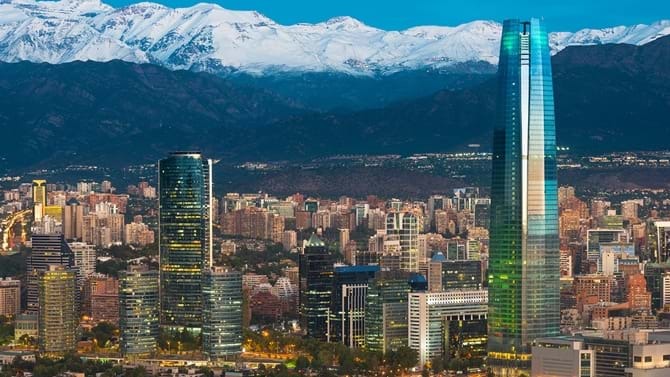 The Confederation of Danish Industry and the Danish Embassy in Chile hereby invite your company to join a business delegation travelling to Santiago de Chile to connect suppliers, buyers and financiers at the same table. Chile has some of the largest urban populations in Latin America and some of the most densely populated urban areas in the region. The urban sprawl of the country’s two capitals, Santiago and Valparaiso, compose some of the largest in the region. City development poses challenges at the planning level, and the authorities are working on addressing the needs. By joining, your company will get a unique opportunity to discuss your solutions with the government, city authorities, major developers and international finance institutions, who are all interested in meeting Danish companies, who can provide solutions to create urban development projects in Chile. At the Sustainable City Solutions Seminar with representatives from the local ministries, city authorities from Santiago de Chile, organizations, developers and other relevant business associations, you will get a platform for your company to present your solutions and address local questions and concerns. To address more specific existing business opportunities, meetings will be organised in Santiago to provide insights into business opportunities, focusing on concrete planned investment projects with both public authorities and private developers. Read more about the Chilean market and proram of the delegation in the attached invitation. Excl. VAT. 2 participants per company. The price is calculated on a basis of 10 participating companies and approved 50 per cent subsidy by The Danish Trade Council. Meals mentioned in the tentative program are included in the price. Flights and hotels are not included in the price.